I have always hankered after one store for all my media accessible to all my devices. I first of all tried this with a PC dedicated to media. It worked fine except I needed to leave it on all the time which was not very energy efficient and quite noisy. So I looked around for a Network Addressable Store with a media server. I finally settled on the LaCie LaCinema HD 1 TByte. It’s small, quiet (no fan), connects directly to my TV via HDMI and sits on my LAN. So I can leave it on without disturbing anybody, yet it’s accessible to anyone in whatever room they are in. The other feature I wanted in my network media server was for it to be UPnP DLNA (Digital Living Network Alliance) compatible. The main reason for this was most if not all media players can recognise a UPnP/ DLNA server on the network. Thus any media player device on my network should be able to fetch media from the server whether it be music, video or photos. Including DLNA in the specification brought a surprise benefit – media shifting. This means that one device can take media from another device and play it on a third device. My mobile phone can take media off my laptop and play it on my TV (via the LaCinema). This feature depends on the software so for instance Windows Media Player 11 cannot send the media to another device but Twonky software can. Being able to store all my media on my home network and shift it around to any player is wonderful, but today everybody wants to be able to stream their media from the Internet as well. Thus we have services like Spotify to stream music, YouTube for videos and Flickr or Picassa for Photos (plus many other services). The PCs and my smartphone on my home network all have access to the internet and can stream whatever service I like. The beauty of DLNA is that I can use a PC or my smartphone to stream from the internet but send it to any other DLNA device for playing. This feature depends on the software so for instance Windows Media Player 11 cannot pass the stream onto another device but Twonky software can. P = although not DLNA compatible will nevertheless play from any UPnP server. There were some DLNA Photo Frames but they don’t seem to be available anymore. Windows Explorer recognises the the LaCie as a network media device but not as a Network Addressable Storage. I can only access the folders on the LaCie through the LaCie Network Assistant. At present I am having a problem playing music from the LaCinema on my mobile. Play stops abruptly part the way through the track. I’m still working this one through with LaCie and Twonky. I really enjoy devices that use my home wireless LAN and Internet gateway . Not so long ago I bought a WiFi Radio which receives internet radio, podcasts and music from my PC media server. All our household mobile phones have WiFi and can therefore access the internet and Skype and, depending on the software, media from home PC. My TV can also access by home LAN and the internet. Now I have acquired a WiFi photoframe a Kodak W1020 which can take feeds from the Internet, from my home LAN or from its own internal storage. Like my WiFi radio (see my earlier blog Internet Radio) you need to link your device, wifi radio or wifi photoframe, to an online service. This is usually done by registering your devices ID with the online service . My Revo Blik Radio Station uses Frontier Silicon Radio Portal . My Kodak W1020 wifi photoframe can take feeds from FrameChannel wireless frame portal or from Kodak’s own portal. 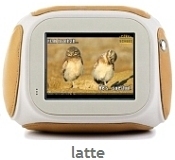 FrameChannel can also feed photo frames from other manufacturers. My Friends Photos is an interesting one as its basically an email address to which your friends and family can send photos, or messages as pictures, which will then appear on your photo frame. I use Flickr for my photos and this service allows you filter your flickr photos by tags. And of course you can regularly change your tags to show an alternative set of your photos. All these ‘channels’ appear intermingled on your connected photoframe. You can also set the duration by channel and the time of day by channel. The Kodak frames also have a really good way of configuring the frame through touch strips down the right hand side and along the bottom. I like this approach as the screen does get covered in greasing finger prints. In the evening I sometimes sit down to watch the picture frame rather that the TV. Which reminds me this Kodak frame can also show videos but at the moment only those from its internal memory or off the home LAN and you can accompany your pictures with music. As with most frames you can plug your camera into the frame and use the frame as a large viewer for the pictures in your camera (stills or movies). What is coming along though are TVs with internet access through widgets loaded directly into you TV. More fun gadgets to play with and blog about. I am also investigating a Freeview box with wifi called FetchTV which, unlike BT Vision or TiscaliTV, does not require a subscription. I have recently purchased a Revo Blik Radio Station http://www.revo.co.uk. It’s DAB, FM and Internet Radio. Also as it is Wifi it can also retrieve my music from my media server. I needed one with a clock and alarm so I went for Blik but it is therefore mains driven otherwise I would have gone for the portable version the Pico. I can also play my mp3 player through it. So all in all a very flexible bit of kit. To me the appeal of internet radio is not so much the wealth of international radio stations which I can access but the ability to use ‘Listen Again’ services and podcasts. To do this you need to be signed up with an internet radio service that your device can register to. Revo uses http://www.wifiradio-frontier.com With this sort of service you can gather your Favourite radio stations and store them under My Favourites in your own categories. My Favourites is then reflected in the BliK menu using your categories & thus saving you from scrolling through hundreds of radio station. You can also subsrcibe to various Listen Again services and podcasts which also then appear in the Blik menu. I am also trying out the TVersity media server on my PC. This media server can aslo access internet radio, as well as audio and video. The network media receiver I am using to stream media from my PC to my TV immediately recognised the TVersity as TVersity is a UPnP media server. I haven’t yet got to grips with all that it can do with the internet. My ideal device would be one that could give me access to the BBC iPlayer via my TV. My real delight though would be to get hold of a UK Version of the Chumby http://www.chumby.com/ It is more than an internet radio and wifi media receiver. It looks like a cuddly toy, has a screen, you can download widgets to view your news, pictures, weather… I want one! Compare my Solar PV panel performance? Martin R Stone Blog at WordPress.com.